Though you cannot opt out of the My Profile feature, you can choose to keep everything private. The only information that is shared with others is information you choose to share. You don’t need to use virtual shelves, read and interact with other users’ reviews, or track your borrowing history. If you only want to use our website to place holds and renew your checked out titles (which are always private), you can simply ignore all these new functions. If you do choose to add titles to your virtual shelves, create lists, or share ratings, by default, other patrons will see your contributions. These can however, be easily set to private. To do so, go to My Account, then My Settings. Select Privacy (My Shelves/ My Feeds) on the left hand side of the page. Our new website allows you to track your Library borrowing history to look back fondly on your favourite reads. By default, the Borrowing History feature is not enabled for your account. It is your choice whether to let Halifax Public Libraries keep this record. If you choose to enable the Borrowing History feature, a list of the physical titles you borrow from that point forward will be maintained. It does not work retroactively. This list is available to you through your private online account. Staff do not have direct access to this information, although it can be released by the Library to a third party when compelled to do so under a judicial or production order from a court. You can turn this feature off at any time to stop tracking. On the menu, click My Settings. On the My Settings page, under the Account Preferences heading, find your Borrowing History setting. On the Borrowing History page, click the current setting to change it. When this feature is disabled, any existing Borrowing History titles that have not been added to your Completed shelf or to a list will be permanently deleted. If you decide to turn the feature back on in the future, it will begin tracking from the date it was re-enabled. There are many different options in place for you if you'd like to interact on our website while keeping certain things private. Select an anonymous username (recommended). Change the privacy settings for some or all of your shelves. To do so, go to My Account > My Settings > Privacy > My Shelves / My Feeds (on the left hand side of the page). Make specific items private when adding new titles or comments to your shelves. If you decide that you’d prefer to not use any of these features, and wish to unregister from our website, simply contact us via our Contact Us form. Select the E-Library Services tab and provide your username and library card number. We will notify you when the task is complete. 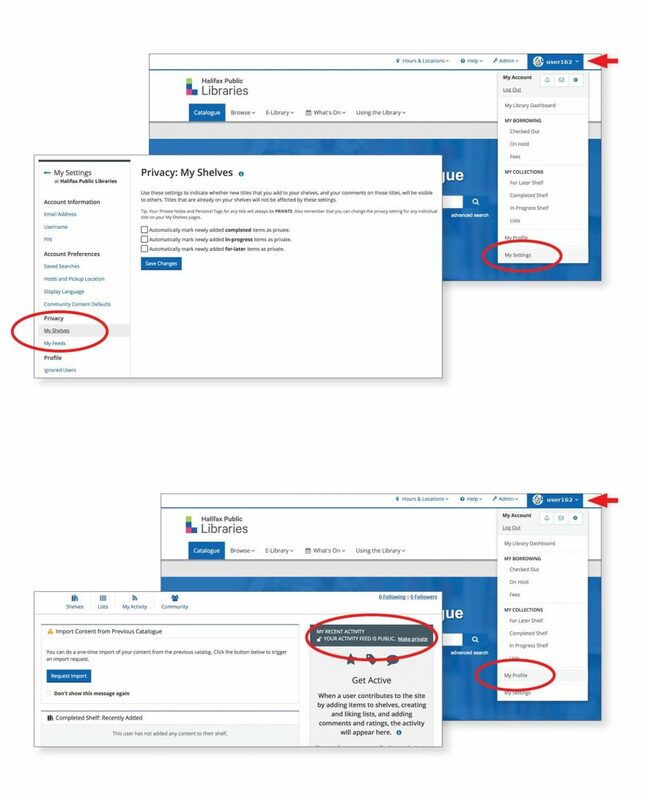 More information about privacy on BiblioCommons-based websites, including this one, can be found here.